If we manage to control one of those we should be able to trigger our XSS. But how can we reach them ? The success function takes the HTML element with id template and adds it as HTML to the div with id result. There is no user supplied data, so it’s probably not vulnerable. The fail function takes an error and display it in the DOM, it uses an insecure innerHTML but all the throw parameters are constant strings, so it should not be vulnerable. The hello function takes a name as an argument and displays it as HTML. This is clearly vulnerable if we can control the name content. To reach the hello function you need to pass through check_name without a throw. throw "Username is too short!" throw "Username is too long!" name shorter than 1 or longer than 1337 characters. < followed by any ASCII letters. onevent= where event can be any ASCII letter combination. This looks quite secure as we need at least a tag and an event to create our XSS, but there is a catch. hello doesn’t add name to the HTML but name.capitalize(). capitalize change the first char of a string to uppercase and the following to lowercase. If we find some characters that are not ASCII but become ASCII when transformed to lowercase we should be able to inject some HTML. Let’s try to find something like this. 8490 - "K".toLowerCase() => "k"
Perfect, we bypassed the HTML tag filter, but is there any event using a k in its name we can use with this tag ? All the events with k in it require some kind of user interaction: onkeyup, onkeydown, onclick ... That means we need to dig more. When you use querySelector the first tag matching the selector is returned. That means: if we submit ?name=<K id=template>test</K> our tag will be inserted inside #hello which is before the real template and therefore will be returned by querySelector. throw "This username is not l33t at all." checkL33tFactor is a simple function, it takes our name and converts it to a value using some kind of hashing function and makes sure the hash is equal to 1337 if not, it throws. A simple way to pass this test is to implement the following l33tify function. // get the hash of our string + "\x00"
// > "Hack the planetZ"
Ok we can now reach success with our controlled input. let’s try to change the success message. Yay, but we cannot inject an event, or can we ? Before being copied from #template to #success the template is transformed again but this time with toUpperCase(). Let’s try to run our brute force function again after we replaced toLowerCase by toUpperCase. 223 - "ß".toUpperCase() => "SS"
305 - "ı".toUpperCase() => "I"
383 - "ſ".toUpperCase() => "S"
64256 - "ﬀ".toUpperCase() => "FF"
64257 - "ﬁ".toUpperCase() => "FI"
64258 - "ﬂ".toUpperCase() => "FL"
64259 - "ﬃ".toUpperCase() => "FFI"
64260 - "ﬄ".toUpperCase() => "FFL"
64261 - "ﬅ".toUpperCase() => "ST"
64262 - "ﬆ".toUpperCase() => "ST"
This are some weird UTF-8 characters, they all convert to ASCII when changed to uppercase, and some of them to multiple ASCII characters! This allow us to use any combination of these character to find a valid event. As we don’t want to rely on any user interaction we choose the onanimationstart= event. To do so, we need to add some style to the tag and an animation to use. Luckily S is available, so it’s easy to add a style tag with our animation. That’s right our JS code is also converted to uppercase. We need to find a way to call alert without using any lowercase. In JS, you can access the constructor of a given object using the constructor property. Also the Function constructor is a function that takes a string as a parameter and creates a new function object with this string as source code. But how can we create the constructor and alert(1) string ? Thankfully JS is not a very secure language and you can use type juggling at your advantage. Since you are able to refer to any HTML tag in the DOM by using it's ID as a variable name. const c = "(_+)"           // "[object HTMLUnknownElement]"
const o = "(_+)"           // "[object HTMLUnknownElement]"
const n = "(_+)"          // "[object HTMLUnknownElement]"
const s = "((1<1)+)"       // "false"
const t = "((1<2)+)"       // "true"
const r = "((1<2)+)"       // "true"
const u = "((1<2)+)"       // "true"
const a = "((1<1)+)"       // "false"
const l = "((1<1)+)"       // "false"
const e = "((1<1)+)"       // "false"
Okay, we got everything this time. This one doesn’t work on Firefox because it handles focus a bit differently than Chrome. Also instead of using Function(payload)() it registers an onclick=alert(1) in the first innerHTML use, and after used _['click'](). This is also way shorter than my solution. 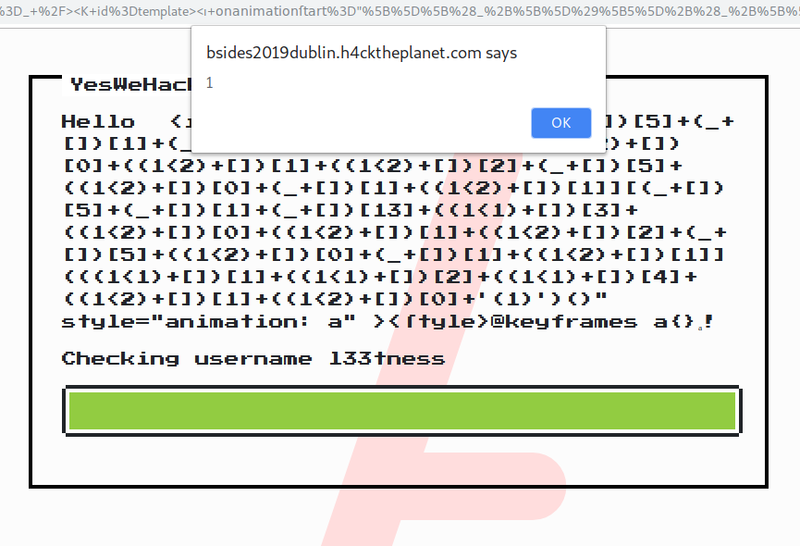 Congratulations to our winners, sadly nobody was able to solve it at BSidesDublin. But don’t worry, we might have new challenges incoming for the next conferences. New features for quicker and improved Bug Reporting !